Embraer and Azul Linhas Aéreas Brasileiras S.A. have signed a contract for a firm order for a previously announced 21 E195-E2 jets. This agreement was revealed as a Letter of Intent (LoI) at the Farnborough Airshow, in July. This contract has a value of USD 1.4 billion, based on current list prices, and will be included in Embraer’s 2018 fourth-quarter backlog. 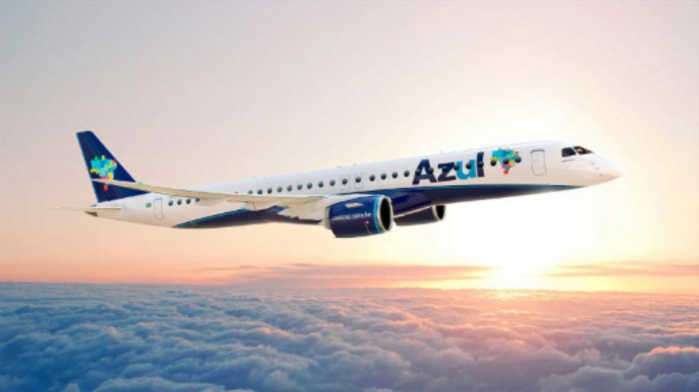 This contract is in addition to the 30 E195-E2 jets ordered by the airline in 2015, raising Azul’s total order to 51 Embraer E2 aircraft. Azul is the launch operator of the E195-E2 and will receive the first aircraft in 2019. Embraer is the world’s leading manufacturer of commercial jets with up to 150 seats. The Company has 100 customers from all over the world operating the ERJ and E-Jet families of aircraft. For the E-Jets program alone, Embraer has logged almost 1,800 orders and 1,500 deliveries, redefining the traditional concept of regional aircraft. Azul S.A. (B3: AZUL4, NYSE: AZUL), the largest airline in Brazil by number of cities served, offers 766 daily flights to 110 destinations. With an operating fleet of 120 aircraft and more than 10,000 crewmembers, the Company has a network of 218 non-stop routes as of September 30, 2018. This year, Azul was awarded best airline in Latin America by TripAdvisor Travelers’ Choice and by Kayak’s Flight Hacker Guide, and also best regional carrier in South America for the eighth consecutive time by Skytrax. Azul also ranked as most on-time airline in Brazil and most on-time low-cost carrier in the Americas in 2017 according to OAG’s Punctuality League, the industry’s most comprehensive annual ranking of on-time performance. For more information visitwww.voeazul.com.br/ir. Be the first to comment on "Embraer and Azul Firm Up Order for Additional E195-E2 jets"